Setting up the G PRO Headset is very straightforward. 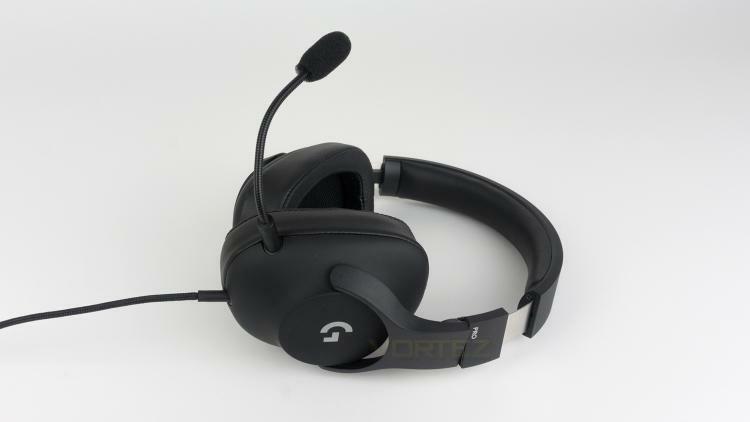 You can opt to plug the headset directly into a controller, your PC or mobile device for audio use only. Alternatively, you could use the supplied splitter to make use of the included removable microphone. This option will only work on PC, however. The first minor concern was with the included inline controller, we found that it is located too far down the cable to use easily during a gaming session. There is however a small built-in shirt clip to help eliminate this problem. It does work, but it isn’t without compromise. Comfort wise the G PRO provided a mixed experience. The earcup opening is large enough to provide plenty of breathing room, and also they don’t create a huge amount of heat build-up thanks to the partially perforated interior of the cups. The slight downside is that the padding is a bit on the thin side, and also the clamping force straight out of the box was a little tight. They do loosen over time, but initially, the force was a bit strong. In regards to build quality of the G PRO, there are no issues. 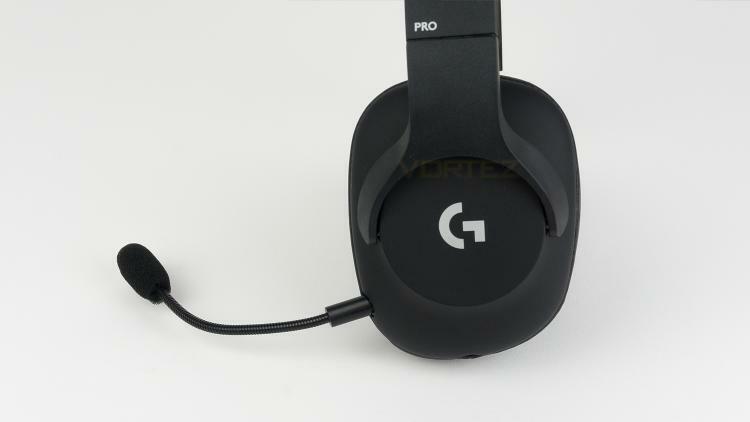 The G PRO utilises a variety of high-quality materials such as a TR90 Nylon headband, a glass fibre reinforced Nylon joint, stainless steel sliding adjustment and leatherette pads. All these materials combined create a headset that feels extremely well put together. At Vortez we like to make sure we cover all aspects of a headset and that has to include sound. For music, we noted that the G PRO has a fairly flat cool profile that doesn’t sway too heavily towards the lower end nor the treble. This means that no area is too overly prominent, so if you enjoy really strong bass or a vigorous treble, you may want to modify the sound profile using an equaliser. Some detail is in the treble is highly noticeable whereas some finer detail is a bit too subdued. Vocal production is very natural and doesn’t have a bright or vibrant tone to it. Watching some movies, we noticed that the bass was again quite potent, if not all-powerful. Deeper bass didn’t quite have the impact that it should have. The treble is good and possesses strong levels of detail, however, some of the more subtle effects were a little bit harder to identify. The sense of space on offer is good too, it’s not vast, however, but it is quite wide and tall. Making use of Windows Sonic and Dolby Atmos did help boost this with the latter improving the effect more so. Next up we tested the G PRO across the usual selection of games that range from esport titles to the more casual offerings. What we found is that for esports titles the sound had some real strong suits, but also some kinks in the armour. We found that the under prominent bass did help as it didn’t envelop or mask the treble to cause any issues there. The treble, although detailed did cause a few issues when trying to identify the smaller details. For example, in some titles, I sometimes found that I couldn’t hear an enemy combatant when flanking. A quick boost to the treble did resolve this and made it a bit easier to help pin down their position. For more casual titles the G PRO performed admirably and offered a good solid experience. The bass again did require some tweaking to help boost the immersion, but the treble offered good quality and provided an enjoyable experience. The microphone on the G PRO is user removable and has an included pop filter. The microphones arm is also flexible meaning that it can be positioned to best suit your needs. The microphone uses a cardioid pickup pattern and has a frequency response of 10 - 10,000Hz. Testing the microphone, we set the gain to +10dB and used a recording volume of 90%. There was no added effects or noise cancelling used during testing. With those settings, we found that the microphone is pretty quiet and thus would require you to increase the gain to bring up the volume level. However, we did note that upon doing this, the added gain introduced artefacts in the sound. The sound - using the testing volumes, is quite clear with decent amounts of detail in the voice. However, the microphone isn’t the most natural sounding as there is a subtle artificial sound when speaking. Background noise was also barely audible meaning that the microphone relies on noise cancelling, and thus could be the reason why we experienced the artificial sounds when speaking. Bass pickup is decent meaning that your voice doesn’t sound too thin or without weight.